From the Valnerina to the Amerino. In the places of the ora et labora, where heaven and earth touch each other. 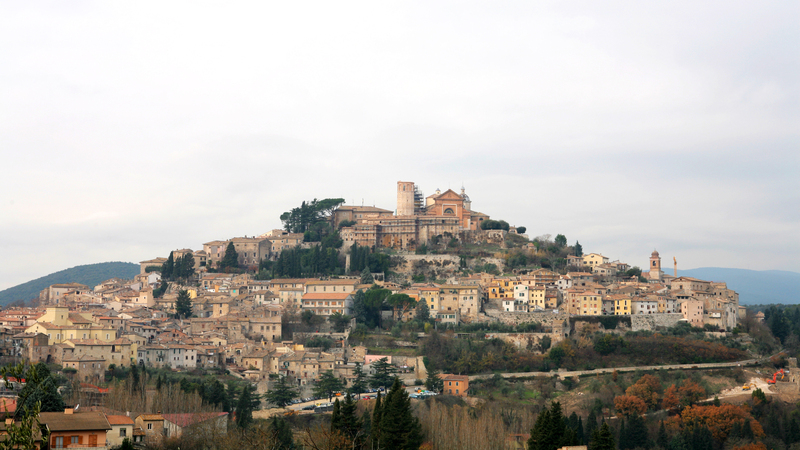 From Norcia to Cascia the journey resumes in an atmosphere of profound spirituality that seems to be emanating from the stones once trampled by Saint Benedict, Patron of Europe, and by Rita, the Saint of the “impossible” miracles. Two extraordinary personalities, full of faith and courage, which have left an indelible mark of mysticism on these places of an intense and mysterious green. A mysticism that coexists, with a naturalness that is almost unbelievable, with pagan myths and legends that speak of sibyls, witches and necromancers, and also with the other life and everyday material that, among the various activities, many of the which revolve around agriculture and gastronomic products, in the art of norcineria has its historical landmark. Moreover, the Benedictine rule of the pray and work is perhaps not the happy synthesis of a way of being and living by its inhabitants in this land of hard work, but also a source of satisfactions, succeeding at the same time to reach the height of the sky and the size of the infinite? But the surprises are not over. And they are located in beautiful places: in the magical Piani di Castelluccio that, with the famous “flowery”, present an unforgettable scenery; in Monteleone di Spoleto where the famous bronze carriage of Etruscan manufacture was found; along the “path of transhumance”, the road between Poggiodomo and Scheggino, crossed by shepherds during the seasonal migration of herds. It attracts and appalles at the same time the close encounter with the mummies of Ferentillo, dozens of bodies naturally mummified in the Romanesque crypt of the church of Santo Stefano. Finally we return … to see the stars in Terni, the strong city of steel mills and the romantic home of Valentine’s Day, protector of lovers, who plunges into the nearby Marmore Falls, the highest in Europe and Lake Piediluco. Umbria is not bathed by the sea, yet water is, together with its land, the lifeblood of this community, as well as an important ingredient of good eating, along with naturally flour, wine and extra virgin olive oil. Colli Amerini with an unmistakable bitter taste and a little spicy. Not only lakes and waterfalls, but also rivers, streams and springs as pure as those of San Gemini, have always given the Umbrian landscape a further touch of beauty and prosperity. That landscape which comes alive with unique sites in the world and remains of lost cities like Carsulae; and also of shivering tales like the famous “Chronicles of Narnia” that are inspired by secrets, wonders, witchcraft, magic, suggestions that surround the territory of Narni. Prodigy made reality are undoubtedly the “Cyclopean” walls of Amelia. As well as, not far from Avigliano Umbro, the fossil forest of Dunarobba which is opposed, as a sort of law of retaliation, the colorful and lively life of the marsh flora and fauna that find their exceptional habitat in the Alviano Oasis.